Dear Periwinkle Team, "Hats of to you" !!!!!!! We are fully satisfied with you performance. 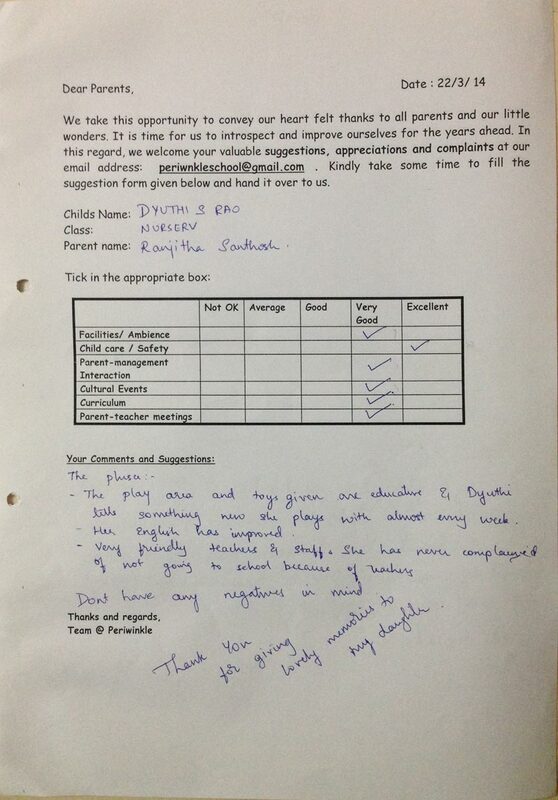 Felt happy to select your school for Purvi’s Play Group. 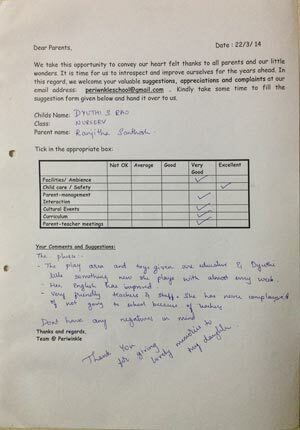 Dear Periwinkle Team, Our Sincere thanks to all the teachers and helpers in contributing to Aditya’s Growth at Periwinkle Preschool. I really appreciate the way the way you have taken care of my son and other children. 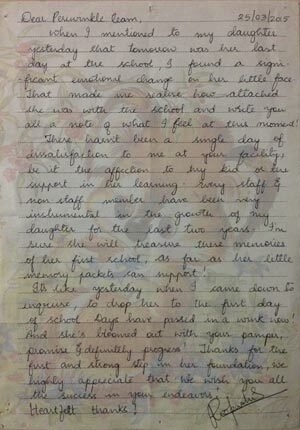 Affection, Learning and discipline… you name everything, you have provided it with utmost care to Aditya at your school. Thank you. 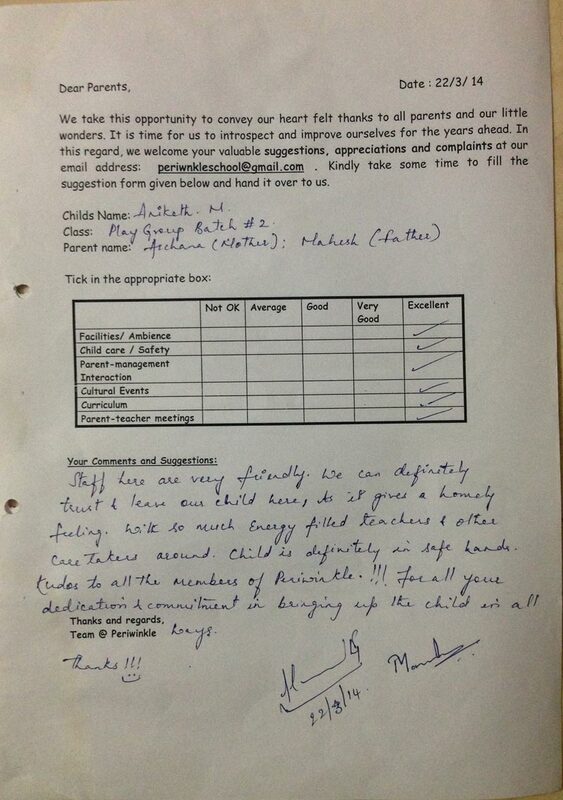 Dear All, Good personalized attention given to the kids. Please keep it up. Cultural events and school day were exceptional. All kids got an opportunity to show their talent. School has inculcated all our customs and traditions along with your academics. Heartfelt thanks to the Periwinkle team. Hi Periwinkle Team, Actually, I was very apprehensive to contact any school, as my daughter was thrown out from the main stream regular school. That’s when we approached Periwinkle Preschool to give an inclusive education to my little slow learner along with other kids. Today, it’s been 3 years after I approached your school and I am a guilt free happy parent. Thanks to Periwinkle for all the patience and affection they showed to my daughter. All the teachers and helpers are very compassionate and showed genuine love to my Nimisha. 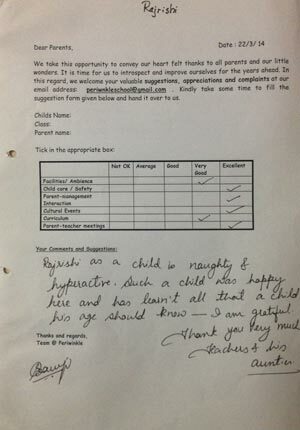 She has improved and grown commendably with Periwinkle’s educational support. We thank Sahana ma’m for counseling us and giving us the confidence by making Nimisha one of blooms of Periwinkle. We are immensely grateful to the whole of Periwinkle Team.